As you read this, recall that Alishan and Tengu Natural Foods were founded because we wanted natural peanut butter. This summer I traveled with my family to Uganda and Kenya. I had visited the same area over 30 years ago for the simple direct experience of “knowing”. This time round we wanted not only to “know” but also to visit organic farming friends and suppliers. 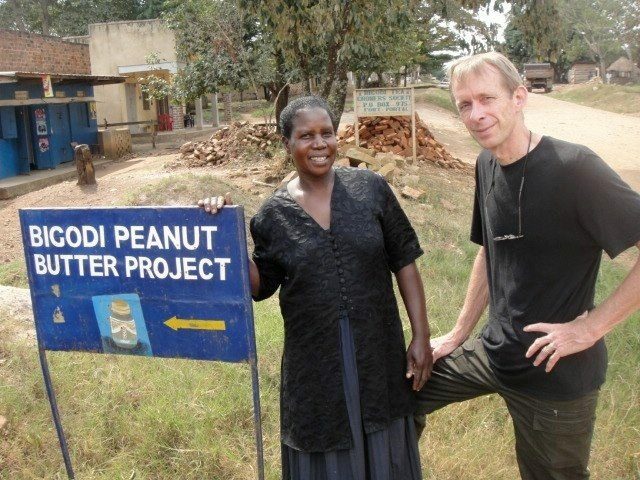 In Uganda and most of Central Africa peanut butter, peanut sauce and peanut powder are a staple. They call them g-nuts ( short for ground nuts). In Western Uganda, an hour south of Fort Portal at the base of the Ruewenzori Mountains we traveled to the very small village of Bigodi on the edge of the Kibale Forest. Kibale has the highest density of primates in the world. There we met Helen Bandashi one of the organizers of 100 woman farmers. In Ugandan villages woman are the main farmers. These members cultivated plots of 1 to 10 acres ( 10 acres is very, very large for a village farmer). Uganda soil is very rich, fertile and for the most part water is not a problem. sesame and g nuts are both roasted in a pan over a wood fire. A 400gram jar sells for around $2.50 at a store in Fort Portal. Helen also raises rabbits in back yard hutch, a pen of pigs and little piglets. All good cash and protein providers. We will be staying in touch with the project and hope to support them in some way to develop further.